Acute disseminated encephalomyelitis or multiple sclerosis: can the initial presentation help in establishing a correct diagnosis? The differential diagnosis of CNS white matter disease is broad, and can be divided into vascular, metabolic, infective, or inflammatory aetiologies. Isolated inflammatory disorders of the CNS are often associated with demyelination, and the two terms (inflammatory and demyelinating) are often used in conjunction. When the disease is monophasic, the term acute disseminated encephalomyelitis (ADEM) is used.1 ADEM typically occurs as a post-infectious phenomenon, and by definition, must be an isolated (monophasic) episode. If a relapse occurs shortly after the ADEM presentation in association with a further infection or steroid withdrawal, the term MDEM (multiphasic disseminated encephalomyelitis) is used. When there are relapses or progressive disease, the term multiple sclerosis (MS) is used (for full recommended diagnostic criteria for multiple sclerosis refer to McDonald and colleagues2). The diagnostic differentiation between acute disseminated encephalomyelitis (ADEM) and multiple sclerosis (MS) is important mainly for prognostic reasons. Children with ADEM are generally expected to do well, whereas children with MS are more likely to develop significant disability. The ability to reduce MS disease progression with immunomodulatory drugs further emphasises the importance of a prompt and accurate diagnosis. 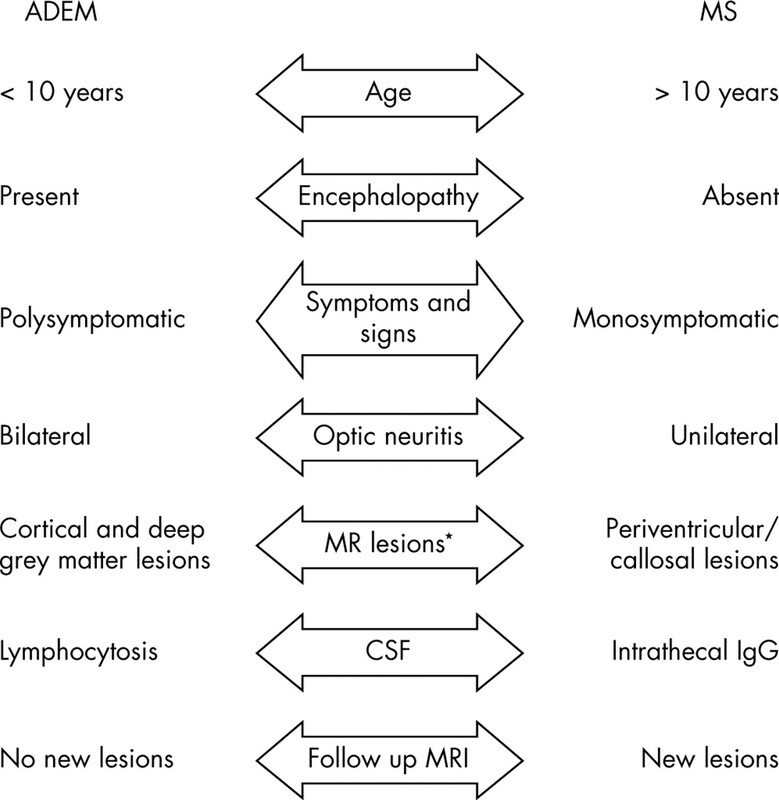 Over the last five years, there have been a number of large series reporting the clinical features of paediatric ADEM, MS, and the differences between these.3–8 A large follow up series of children with a first episode of central nervous system (CNS) inflammatory demyelination showed a much higher rate of progression to multiple sclerosis than previously reported.8 The clinical features of these treatable disorders are therefore the subject of this review. It must be stated from the outset that the clinical and laboratory differences between ADEM and MS are trends only, and do not provide rigid diagnostic criteria. Diagnostic dilemma: are ADEM and MS separate clinical entities or part of the same demyelinating spectrum? As would be expected from an infection mediated syndrome, ADEM most commonly presents during winter and spring.3,4 Between 51% and 74% of ADEM patients have a history of a precipitating infection with a mean latency of approximately two weeks.3–6,8 A large number of infections may precipitate ADEM, although isolation of a specific agent is uncommon (classic infectious precipitants include measles, Epstein-Barr virus, mycoplasma, and group A streptococcus).1,10 Although infections may precipitate an MS relapse, the association with infections and seasonality is less pronounced (only 16% of patients have an infection in the preceding month8). In keeping with an explosive post-infectious phenomenon, patients with ADEM frequently have raised inflammatory markers (white cell count, erythrocyte sedimentation rate) and lymphopenia.3,4,6 In contrast, in MS these are frequently normal.3 The CSF more commonly shows an increased protein and cell count (lymphocytosis) in ADEM, although normal and abnormal CSF findings occur in both ADEM and MS.3–6,8 One of the most discriminating CSF findings is the presence of intrathecal synthesis of oligoclonal bands (oligoclonal IgG in CSF but not in serum), which occurs in 40–95% of MS patients, but only 0–29% of ADEM patients.3,5,6,8 Indeed, some authorities would seriously question the diagnosis of MS if there were not intrathecal synthesis of oligoclonal IgG. (A) MRI brain (T2 weighted) in MS showing well demarcated lesions in the region of the periventricular white matter. (B) MRI brain (T2 weighted) in ADEM showing a large mass-like lesion in the white matter. (C) MRI brain in ADEM showing multiple large lesions with poorly defined margins and relative periventricular sparing. Follow up MRI is useful in ADEM/MS differentiation. As would be expected, new lesions should not occur in ADEM (0–9% of ADEM patients have new lesions on follow up).3,5,21,22 The original lesions in ADEM completely resolve in 27–55% of ADEM patients, although more typically (45–64%) the lesions only partially resolve.3,20,21 By contrast, new lesions in MS are anticipated.17 The timing of repeat scanning is important, as too hasty a repeat scan may cause confusion if the patient is still in the acute/subacute phase. A lag time of six months after presentation would be appropriate for repeat scanning (when clinically indicated). A recent important study of French children (n = 296) who suffered one episode of acute CNS inflammatory demyelination found a higher risk of progression to multiple sclerosis than previously reported (57%).8 This study has highlighted the need for caution in counselling parents regarding the risk of further events. The recent published reports of ADEM and MS in children have highlighted some differences between the two conditions, which are reviewed in fig 3. It must be reiterated that these features are trends only, and there remains no diagnostic test for multiple sclerosis. Despite the significant advances in our understanding of the pathogenesis of inflammatory demyelinating CNS disorders, the only truly reliable diagnostic test remains time. Clinical and investigation differences between ADEM and MS (trends only). *MR lesions other than white matter. RCD has a training fellowship awarded by Action Medical Research and the Barnwood House trust. We would like to thank Gavin Giovannoni for his support. Tselis AC, Lisak RP. Acute disseminated encephalomyelitis. In: Antel J, Birnbaum G, Hartung HP, eds. Clinical neuroimmunology. Blackwell Science 1998:116–146. McDonald WI, Compston A, Edan G, et al. Recommended diagnostic criteria for multiple sclerosis: guidelines from the International Panel on the diagnosis of multiple sclerosis. Ann Neurol2001;50:121–7. Dale RC, de Sousa C, Chong WK, et al. Acute disseminated encephalomyelitis, multiphasic disseminated encephalomyelitis and multiple sclerosis in children. Brain2000;123 (pt 12) :2407–22. Murthy SN, Faden HS, Cohen ME, et al. Acute disseminated encephalomyelitis in children. Pediatrics2002;110 (2 pt 1) :e21. Tenembaum S, Chamoles N, Fejerman N. Acute disseminated encephalomyelitis: a long-term follow-up study of 84 pediatric patients. Neurology2002;59:1224–31. Gupte G, Stonehouse M, Wassmer E, et al. Acute disseminated encephalomyelitis: a review of 18 cases in childhood. J Paediatr Child Health2003;39:336–42. Mikaeloff Y, Suissa S, Vallee L, et al. First episode of acute CNS inflammatory demyelination in childhood: prognostic factors for multiple sclerosis and disability. J Pediatr2004;144:246–52. Brex PA, Miszkiel KA, O’Riordan JI, et al. Assessing the risk of early multiple sclerosis in patients with clinically isolated syndromes: the role of a follow up MRI. J Neurol Neurosurg Psychiatry2001;70:390–3. Stonehouse M, Gupte G, Wassmer E, et al. Acute disseminated encephalomyelitis: recognition in the hands of general paediatricians. Arch Dis Child2003;88:122–4. Poser CM. The pathogenesis of multiple sclerosis: a commentary. Clin Neurol Neurosurg2000;102:191–4. Parkin PJ, Hierons R, McDonald WI. Bilateral optic neuritis. A long-term follow-up. Brain1984;107 (pt 3) :951–64. Morrissey SP, Borruat FX, Miller DH, et al. Bilateral simultaneous optic neuropathy in adults: clinical, imaging, serological, and genetic studies. J Neurol Neurosurg Psychiatry1995;58:70–4. Kepes JJ. Large focal tumor-like demyelinating lesions of the brain: intermediate entity between multiple sclerosis and acute disseminated encephalomyelitis? A study of 31 patients. Ann Neurol1993;33:18–27. Paty DW, Oger JJ, Kastrukoff LF, et al. MRI in the diagnosis of MS: a prospective study with comparison of clinical evaluation, evoked potentials, oligoclonal banding, and CT. Neurology1988;38:180–5. Kesselring J, Miller DH, Robb SA, et al. Acute disseminated encephalomyelitis. MRI findings and the distinction from multiple sclerosis. Brain1990;113 (pt 2) :291–302. Hartung HP, Grossman RI. ADEM: distinct disease or part of the MS spectrum? Neurology2001;56:1257–60. Mikaeloff Y, Adamsbaum C, Husson B, et al. MRI prognostic factors for relapse after acute CNS inflammatory demyelination in childhood. Brain2004;127:1942–7. O’Riordan JI, Gomez-Anson B, Moseley IF, et al. Long term MRI follow-up of patients with post infectious encephalomyelitis: evidence for a monophasic disease. J Neurol Sci1999;167:132–6. Anlar B, Basaran C, Kose G, et al. Acute disseminated encephalomyelitis in children: outcome and prognosis. Neuropediatrics2003;34:194–9. Boiko A, Vorobeychik G, Paty D, et al. Early onset multiple sclerosis: a longitudinal study. Neurology2002;59:1006–10. Simone IL, Carrara D, Tortorella C, et al. Course and prognosis in early-onset MS: comparison with adult-onset forms. Neurology2002;59:1922–8.